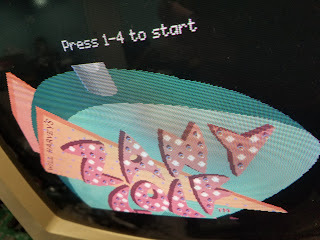 So I was mentioning that I had mis-measured the dimensions on the Dragon's Lair ROM board (see previous blog post) and Shaun Wood suggested that I look into getting a Triangular Scale. In case the link expires, it is showing a "Staedtler Mars 12" Architect Triangular Scale (987 19-31BK)". 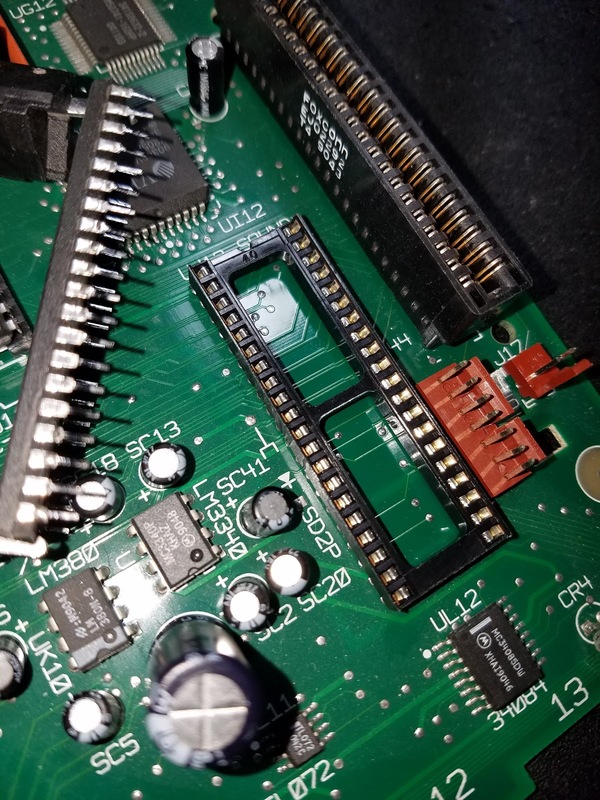 The picture (if you click on it) clearly shows that an inch is divided into tenths which makes for convenient PCB measuring since PCB manufacturers often use tenths of inches as their scale. Well, I tried to find this piece on Amazon for free shipping and couldn't. So I just googled it and found that an Office Depot local to me (on my way home, in fact!) carried it. So I thought "Great!" I went to the Office Depot, walked inside and quickly turned down a random isle so that I wouldn't attract attention. (For some reason, I kinda get nervous about an employee walking up to me and asking if I need help finding anything.) So I went down a random isle, pulled out my phone, and pulled up the link that Shaun Wood had provided. I took note that it was the model "98719-31BK" then said to myself "Ok, now to find where it is in this store!" I looked up from my phone and literally right in front of me was what I was looking for. Haha! I've never had that happen before: going down a random isle and winding up exactly where I wanted to be. That's the first irony of the story. The second irony is that as I examined the "98719-31BK", I noticed that it was divided into 16th's , not 10th's. "What the heck?" I muttered to myself, as I looked at the back. 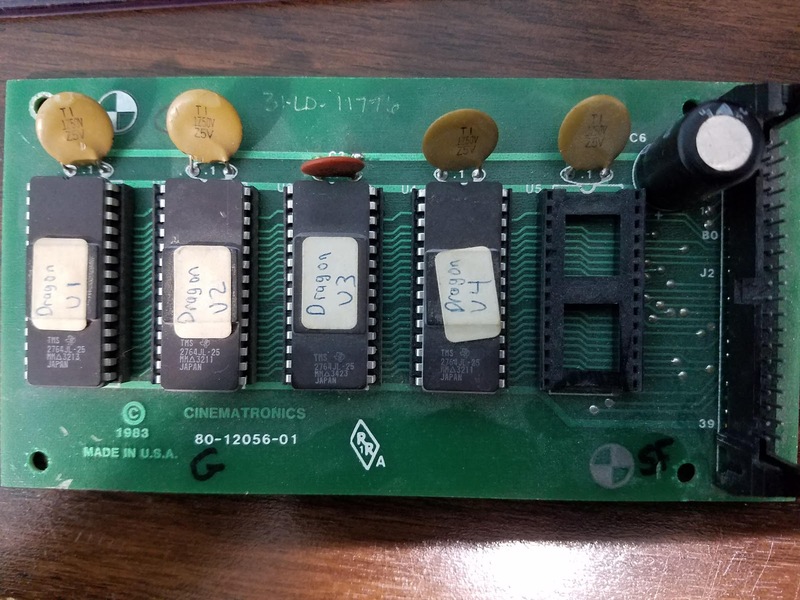 On the back of the packaging, it said that the 98719-31BK had standard 'ruler' type divisions such as 1/8, 1/4, 3/16, 3/8, 1/2, etc. And I also noted that the similarly branded 98719-34BK was the one I actually wanted, which was divided into 1/10, 1/20, 1/30, etc. "Oh, great," I grumbled. 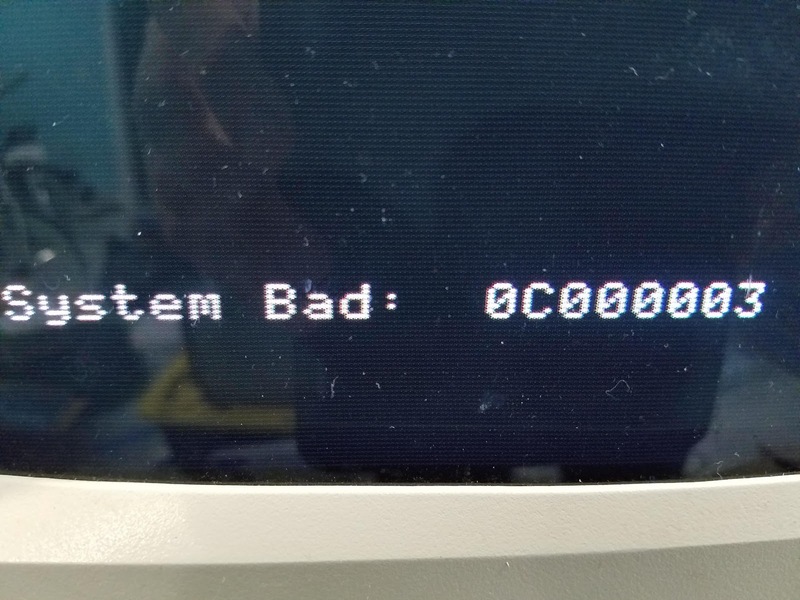 "I came all this way to find the 98719-31BK only to learn that it's not the one I even want!" Then I looked up and right next to the 98719-31BK was hanging a 98719-34BK, the very item that I wanted! I felt kind of bemused. Shaun inadvertently links me to the wrong item but it has the right picture. I go to the Office Depot to get the wrong item (unknowingly) only to find out that they have the right item right next to the wrong item. And as a bonus, I randomly walk right up to it without even paying attention to where I am going. It felt awesome and kind of bewildering all at the same time. That's all my story. Good day. 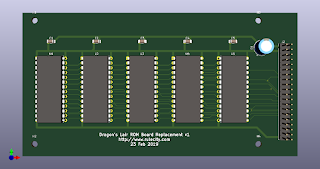 After I discovered that my Eagle v7 license only allows PCB sizes of something like 6" x 4" (I was disgusted), I decided to learn KiCad so that I could make larger PCBs. 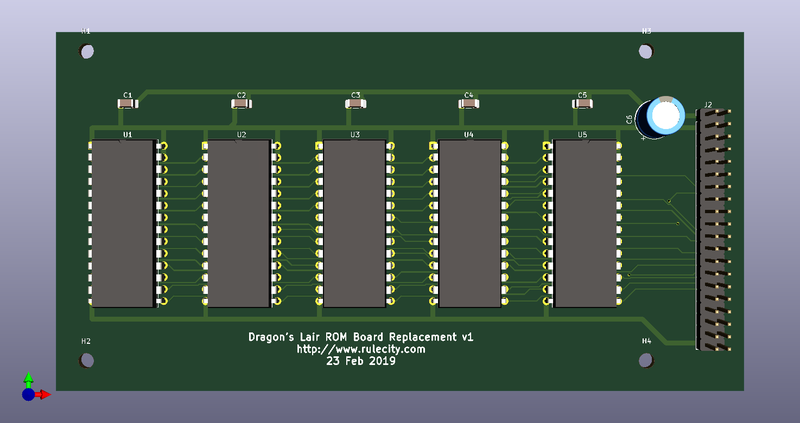 Needing a simple and easy PCB to start with, I decided to reproduce the Dragon's Lair ROM board which is very basic. All it has is a connector, five EPROM sockets, and some capacitors. Here's what I ended up with. 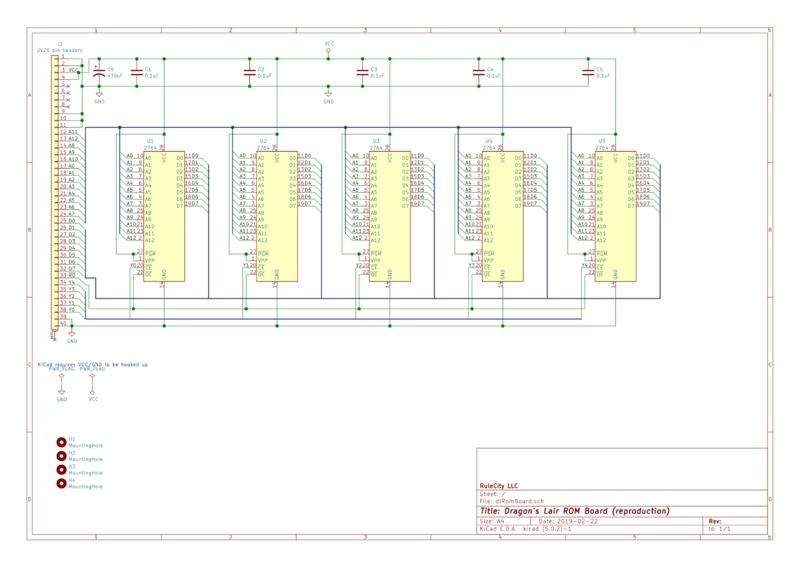 I am pretty happy overall with the tool, although I did a find at least one feature that Eagle has that KiCad doesn't have that I am missing. 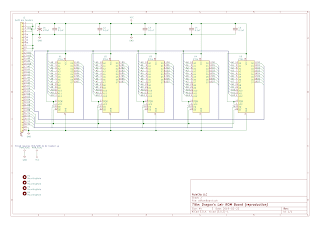 Still, I think KiCad may be the overall winner between the two considering how far astray Eagle has gone these days. 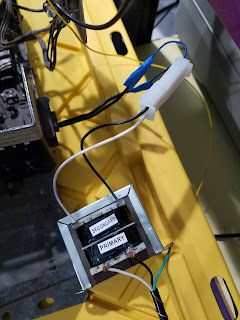 Someone had cut off the original molex power connector for this G07. 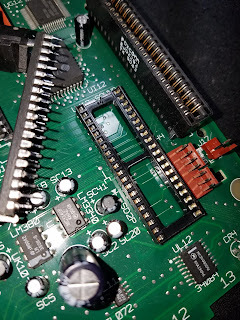 I studied the connector for another G07 that I have in my Dragon's Lair and found what I believe is a compatible replacement. 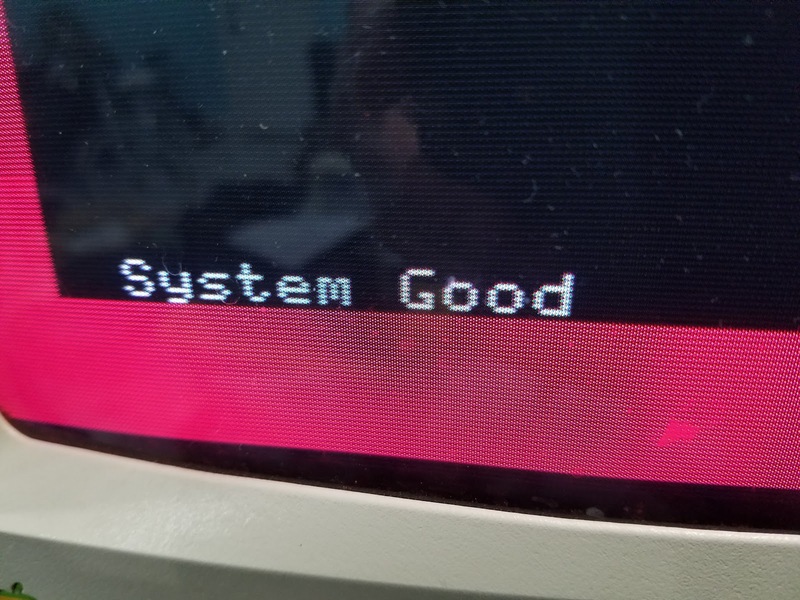 A small victory, but at least it was a mini project completed. Making great progress on Euro DL! When I haven't used my Digilent Digital Discovery logic analyzer for a while, I kinda forget how to use it. This logic analyzer is really nice because it's relatively cheap but can capture 32 channels (!!) and has some pretty decent software to help me visualize my data. The only real downside that I've found is that it doesn't stream so you can't have arbitrarily large samples. This is the one killer feature of the Saleae which prevents me from saying that the Digital Discovery wins in every category. However, it does have a decent buffer size especially for 'slower' capture speeds like 1 MHz which is usually plenty for the old tech that I like to study. Without further ado, here are my notes (to myself) for how to set up the software to make the logic analyzer do what I want. And a bonus youtube video at the end illustrating all of it. If using trigger, change trigger dropdown to 'normal'. Else, set it to 'none'. Set 'base' to how much time you want to capture. 'Samples' will be auto computed. Note, streaming doesn't seem to be supported, so the higher the sample rate, the smaller the sample size. Set trigger to 10% or less. 10% will capture 10% of data before the trigger happened which is often the most useful for me. Dexter closer to fully supporting European Dragon's Lair! Making some progress on Euro DL support for Dexter! So when I was a kid, my dad bought an Apple IIgs for Christmas of 1986 and I loved that thing and used it until I finally gave up around 1993 and moved to a MS-DOS 486. 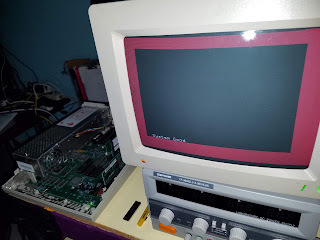 Well, the ROM 03 IIgs came and I left it in a box for many months. Finally, last Father's Day, I opened it and tried to show my kids some games. 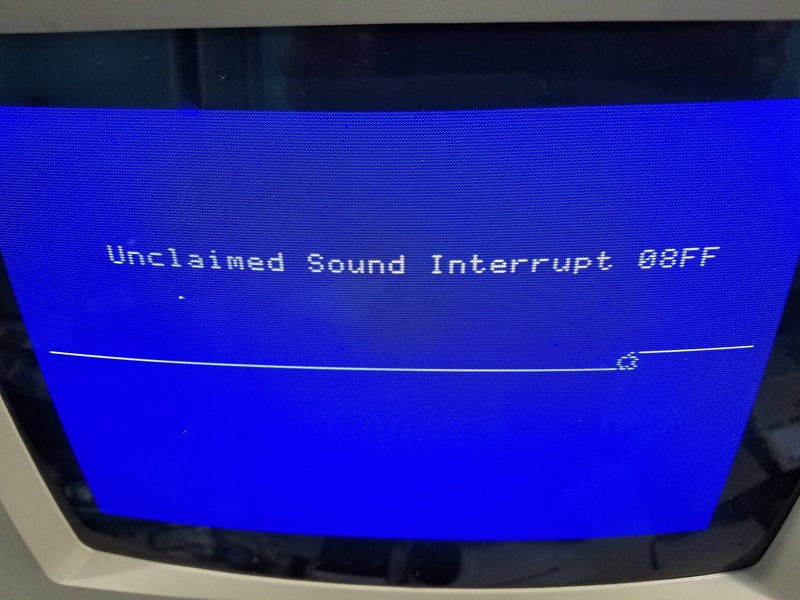 That's when I discovered that it had a sound problem! Fast forward to a week ago. An accelerator board and a power supply replacement that I paid for literally 7 months ago finally showed up and I was eager to install it in my ROM 03. 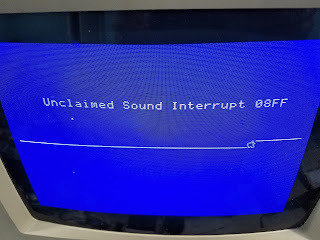 But I decided that I really wanted to fix the sound problem before messing with the accelerator. 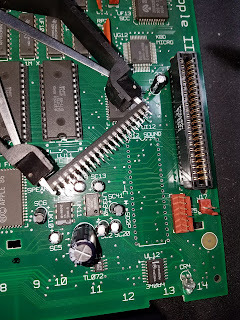 My first attempt to fix the problem was to simply de-solder the sound chip and socket it. I've done this sort of thing several times on arcade PCBs so not only was I familiar with how to do it, but I already had a de-soldering gun along with several 40 pin sockets so I didn't have to wait for any parts to arrive. Unfortunately, it did not fix my problem. 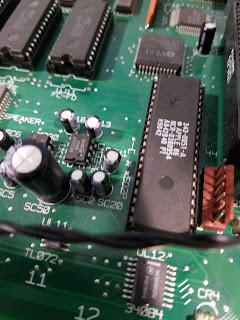 I wanted to replace the sound chip, but didn't want to destroy a working Apple IIgs. 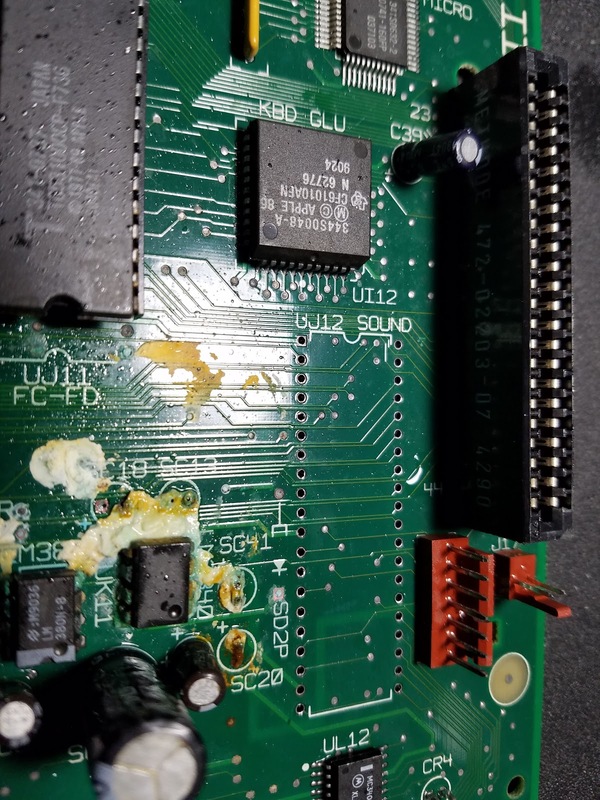 Fortunately, someone was selling a "battery acid destroyed" IIgs motherboard on ebay, so I got it for fairly cheap. The acid damage was really bad but it looked like the sound chip was still okay, so I desoldered it.